If a creditor sues you, you have a choice: hire a lawyer or attempt to litigate yourself. Be warned, however: your chances of winning significantly diminish if you try to defend yourself in a debt collection lawsuit. When a litigant defends oneself in a lawsuit, that’s called pro se, which is Latin for “in one’s own behalf.” In debt collection lawsuits, trying to be your own lawyer can prove very damaging to your case. 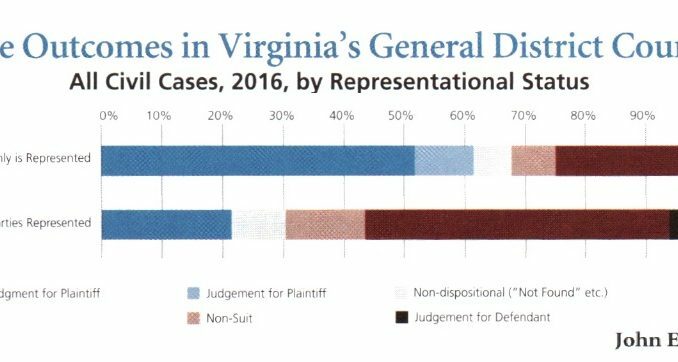 Take a look at a recent study on Virginia self-represented litigants by Blue Ridge Legal Services, the Legal Aid Society for Shenandoah and Roanoke Valleys. The study examined Virginia General District Court cases from April 1, 2015 through March 31, 2016. The Blue Ridge study found that the vast majority of civil cases in Virginia include at least one unrepresented party. And those unrepresented parties do not fare well. As the graph above shows, success rates for unrepresented parties are much, much worse than for those litigants who hire a lawyer. The study’s results would likely replicate across jurisdictions. than when they are unrepresented. Perhaps not every case calls for a lawyer. But if a creditor goes through the trouble of suing you, the amount sought is likely substantial enough to justify hiring an attorney. Do not delude yourself into believing that being right is enough. You must vigorously preserve your options in litigation to ensure a favorable outcome. Defend yourself in a debt collection lawsuit? No. If the damages are small enough, who cares? Simply pay the debt and get ride of the lawsuit. But if the numbers are big time, do not defend yourself. Hire a debt defense attorney to exert your affirmative defenses and attempt settlement of the debt on your behalf.